Joshua Tree National Park offers more than Dr. Suess-looking trees. 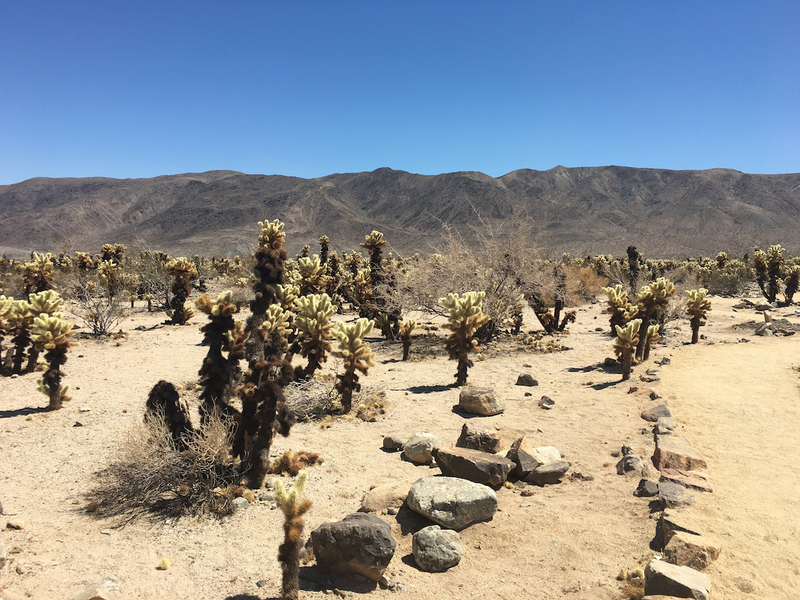 During a recent road trip through Southern California, National Parks TravelingMom took a detour off the interstate to discover two different desert ecosystems in a park that’s easy to explore from a car. 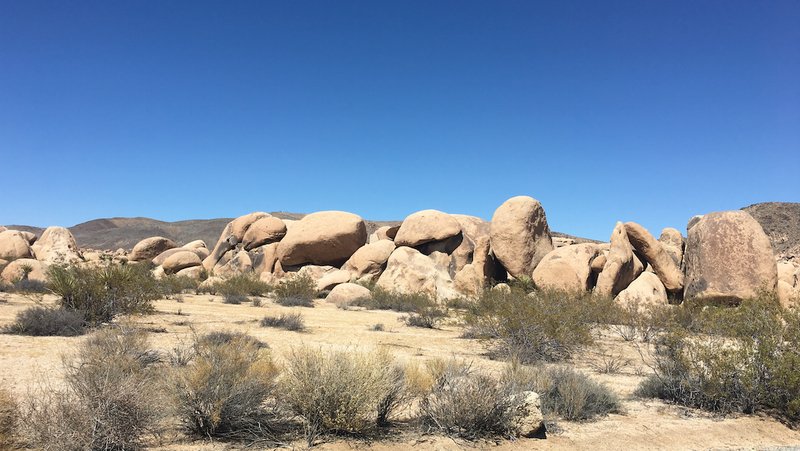 A few hours outside Los Angeles and in Palm Springs’ backyard, Joshua Tree features rock piles and teddy bear looking cactus along with the spiky trees from a music lover’s bucket list. Road trippers leaving Los Angeles might fail to look beyond the lane lines as they race east to Phoenix, Arizona. 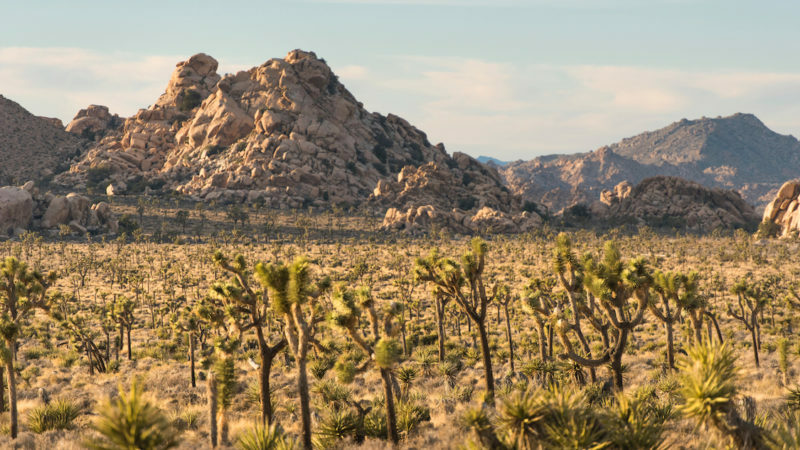 Just outside Palm Springs, Joshua Tree National Park offers families a glimpse into two different desert ecosystems. Best explored during the school year, families can hike in a national park larger than the state of Rhode Island looking for the Joshua tree. For road trippers traveling along Interstate 10, a drive through Joshua Tree National Park offers a quick overview. I’ve done this on several occasions. Must-stops include Ocotillo Patch and Cholla Cactus Garden along the main road, Pinto Basin Road. Stop at a visitor center for current conditions and a map. The West and North entrances offer the highest concentration of Joshua trees along Park Boulevard with several stops along the way. Keys View provides a panorama of the Coachella Valley, located off Park Boulevard also. In 1936, President Franklin D. Roosevelt proclaimed Joshua Tree a national monument. 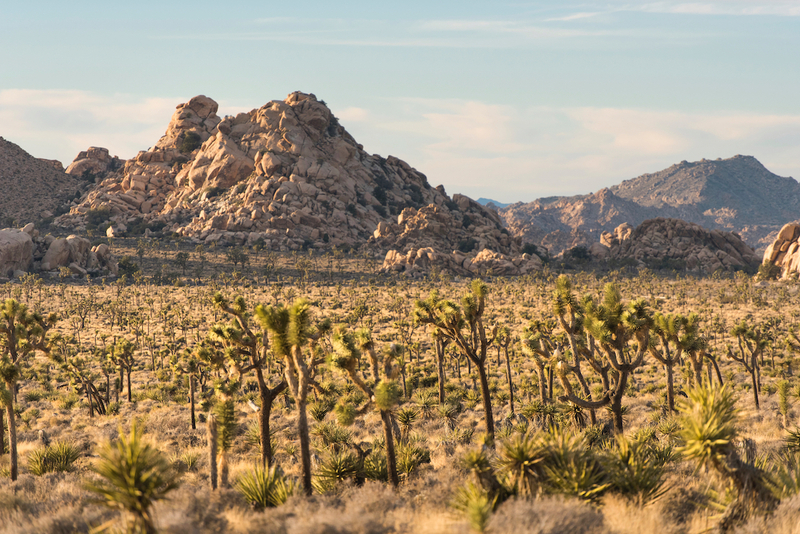 The California Desert Protection Act of 1994 renamed it Joshua Tree National Park. The protected area is a transition zone, where the Mojave Desert and the Sonoran Desert meet. The Mojave Desert with elevations of 3,000 feet and above, provides a unique habitat for pinyon pines, Joshua trees and numerous yuccas and cacti. 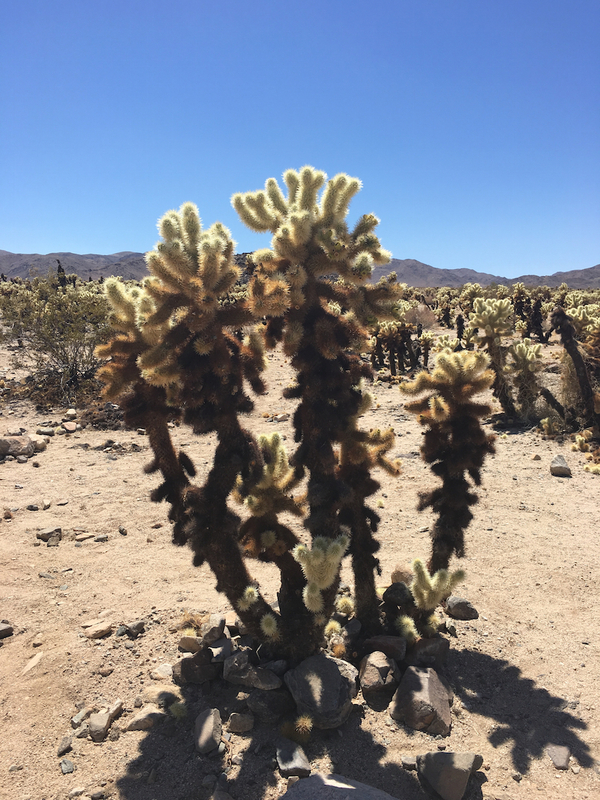 The Sonoran Desert, below 3,000 feet in the eastern portion of Joshua Tree National Park, offers rugged plants, like the Creosote bush, Ocotillo cactus and the kid-favorite, cholla cactus. But beware, the teddy bear-looking cholla plant harbors thousands of thorns. Another signature feature of Joshua Tree National Park is the rock piles. The granite formed rock piles after eons of erosion. The Junior Ranger Program is the go-to program for families to learn more about Joshua Tree National Park. It’s free and takes about two hours to complete. My kids love the badges that the Rangers present them after completing their booklet. The Joshua Tree Junior Ranger badge requires attending at ranger program. Visit an exhibit in the visitor center and have a ranger sign off on the booklet, if ranger programs aren’t offered during your visit. National Junior Ranger badges can be earned at Joshua Tree National Park like the Junior Paleontologist, the Night Explorer patch, and the Wilderness Explorer patch. Joshua Tree National Park offers several hiking opportunities just right for kids. At the southern entrance, the Bajada Trail features an accessible .25-mile loop. Along Park Boulevard, hike the Keys View Trail for a .25-mile trail to the overlook. At the Oasis Visitor Center, the Oasis of Mara offers a pet-friendly .5-mile loop to discover a desert oasis. Moderate hikes require more preparation and should be avoided during the summer. Pick up a map at the visitor center and pack water regardless of the season. Joshua Tree National Park offers nine developed campgrounds within park boundaries. Black Rock and Indian Cove campgrounds offer reservations and the others are first-come, first-serve campgrounds. RV hookups aren’t provided in Joshua Tree National Park although group camping and equestrian sites are available. Regular campsites with water are $20 a night. For hotels, Palm Springs, California, offers lots of options, including unique rental properties. During my visit to Joshua Tree National Park, we stayed at Walt Disney’s former home, complete with hidden Mickeys. Joshua Tree National Park is located 52 miles from Palm Springs, the closest city with commercial flights. Mojave National Preserve is 138 miles north of Palm Springs. Palms Springs features the Santa Rosa and San Jacinto Mountains National Monument, a quick tram ride from the desert floor. Joshua Tree National Park offers three entrances, each located at the north, west and south ends of the park. 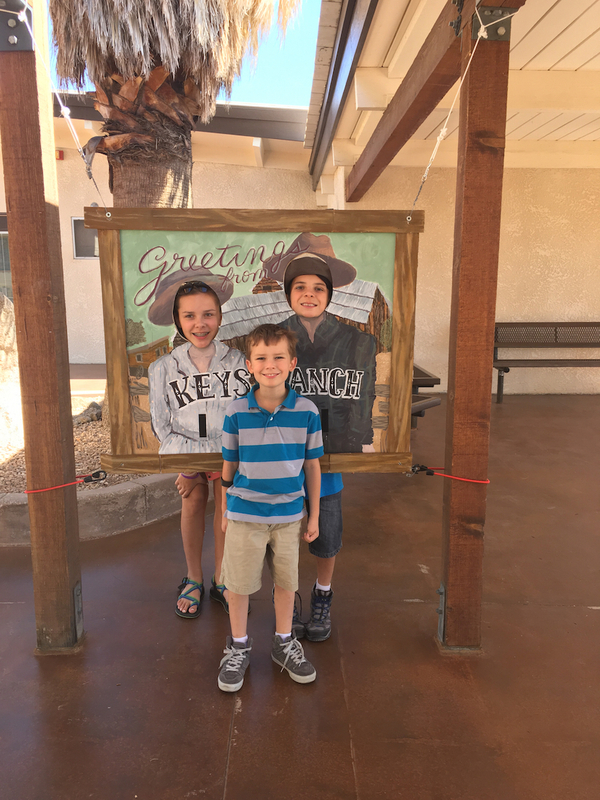 The larger visitor center, Oasis Visitor Center, located in the town of Twentynine Palms, offers an interpretive area and a desert walking path, just right for the youngest kids. 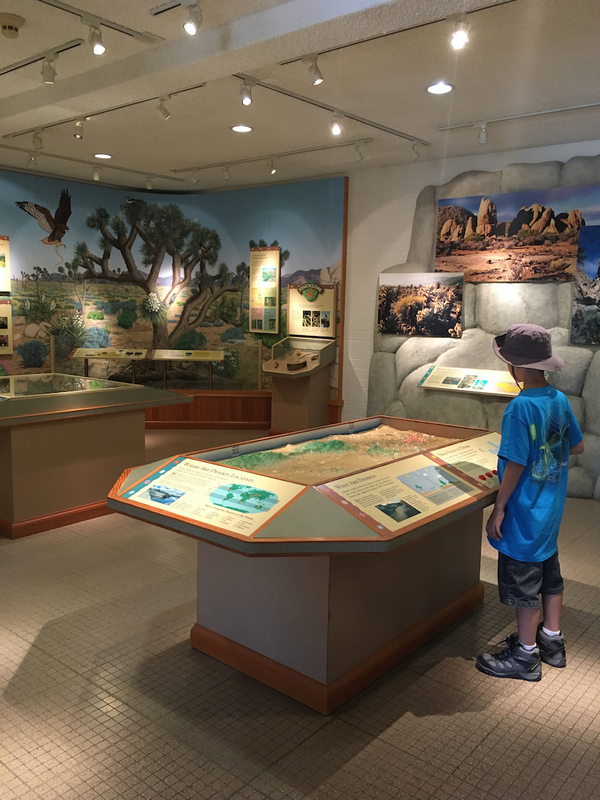 The Cottonwood Visitor Center offers basic assistance, like maps and directions, and staffed by a park ranger. The western entrance station offers water only though the Joshua Tree Visitor Center, located nearby, on California Highway 62. Joshua Tree National Park stays open 365-days a year and 24-hours a day. Use an America the Beautiful annual pass ($80) or purchase a 7-day pass for $25 per vehicle. 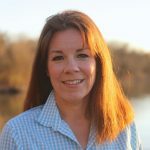 Remember a hat, sunscreen, sunglasses, and water for all seasons. Seven different rattlesnakes call Joshua Tree National Park home. Use maps for navigation, not your GPS. The park offers poor cell phone coverage. Stay out of abandoned mines.